There's a great organization called the Technical Artisans Collective or TAC. 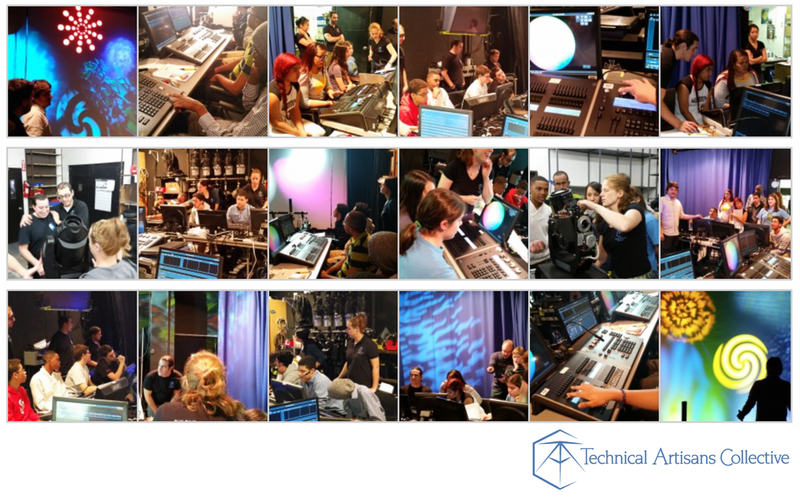 They are a group of professional entertainment technical artists who teach project-based education that bridges math and sciences with humanities through the crafts of technical theatre. We work with school communities to augment their academic and artistic programs through teaching residencies, assemblies, all-day community workshops, mentoring, vocational training, and providing a downloadable online curricula for teachers to access and use. Their goal is to augment schools’ academic and artistic education through applied hands-on curriculum that aims to engage students in their studies physically, emotionally and intellectually. TAC lessons are inter-disciplinary experiences that employ kinesthetic aesthetic learning techniques. They work with schools to develop curriculum that is specific to your needs in the program areas of: Academic Reinforcement, Theatrical Support, Girls’ Technology and Leadership Education, Apprenticeships and Community Events. Recently Barbizon's New York offices participated in an event called Controlling Light that was developed with Barbizon Lighting Company & 4Wall Entertainment Lighting with additional help from Electronic Theatre Controls as a workshop for teens in programming a lighting (ETC Ion) console so they can tell stories with light. Teens learn the history of controlling light; to set-up and control ellipsoidals (lekos), LEDs and moving lights; to use an Ion console and translate that to their own consoles; and to paint stories with light. At the end the day by designing and cuing the greek myth Persephone. Below is a great video of the events of the day.